Image correction without exposure manipulations! Digital cameras are so ubiquitous nowadays that no one really knows how many of them there are in the world. One thing is for sure - the number of digital photographs taken monthly is in the billions. But not all photos come out perfect. Why? Because the cameras aren't perfect. 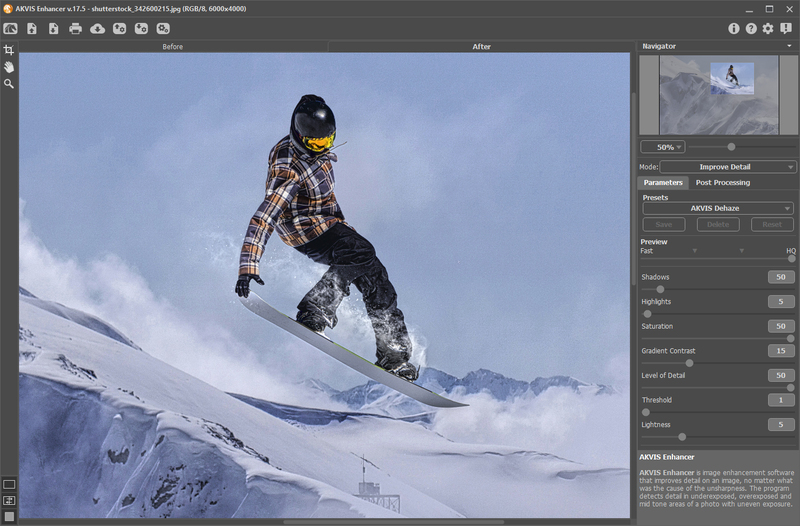 AKVIS Enhancer is a simple image editing utility that enhances images. Namely, the program processes flawed images that lack details and corrects underexposed, overexposed and mid tone areas of the photograph WITHOUT manipulating exposure (a unique feature not available in any other image correction software product currently on the market). Only one (flawed) image is used. Take a look at the clouds in the pictures in this example (click here!) to see what the program can do. Unlike other rather complex solutions, AKVIS Enhancer works automatically and is very easy to use. A good example of a typical problem that can be cured with this product would be an image with background overexposed to the point that objects in the foreground are not easily discernable. Or when some objects are overshadowed and, though visible, make the whole picture look bad. The unique software's algorithm does not use any exposure correction methods. Instead, it strengthens the difference between adjacent pixels having different color gradations, meaning it brings out details by intensifying color transition. The resulting image is sharper, brighter and more natural-looking. A plug-in version is compatible with Adobe Photoshop, Photoshop Elements, JASC Paint Shop Pro and Ulead PhotoImpact. Unlike other software companies that put numerous restrictions, AKVIS Enhancer is fully functional during first 10 days of evaluation period. AKVIS Enhancer is distributed electronically over the Internet; the program is available at http://AKVIS.com for evaluation. The price of a single copy is 69 US Dollars. AKVIS LLC is an independent software developing company specializing in digital image processing software. The company is developing a line of unique image edition software application that currently includes AKVIS Retoucher, AKVIS Stamp and AKVIS Chameleon. The company offers licenses to non-profit organizations (like heritage foundations and historical societies) involved in photo restoration projects free of charge. If you have any questions, would like to request editor's copy, want to inquire about special prices for volume buyers/software resellers, or have a business proposal, please contact Sergey Galenko at pressrelease@akvis.com. - Hard Disk: minimum of 5 MB of free space required.